Our tips on how to get stains out of clothes was created in partnership with Tide. If scrubbing stains, eliminating odors and cleaning clothes are tasks you’re trying to tackle, we are here to help! As a mom of 5, I feel like I’m drowning in laundry each and every week. 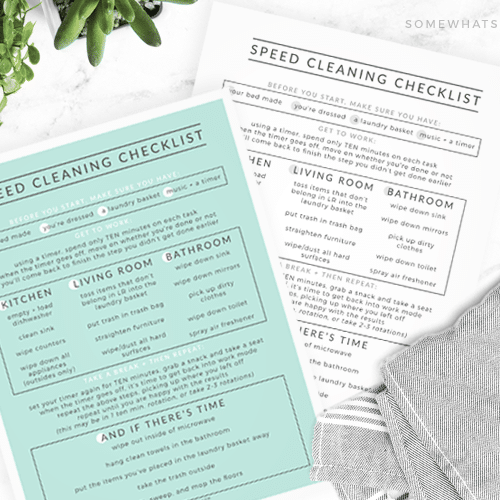 I have a teenager, a toddler and 3 kids in between, so the kinds of stains and smells that come through my laundry room range in variety – muddy pants, high school gym clothes, spilled food from school lunches… you name it, I’ve seen it! After some internet searching, I read that I could make bargain detergent work better by just adding some common laundry hacks like vinegar or baking soda but I was skeptical. 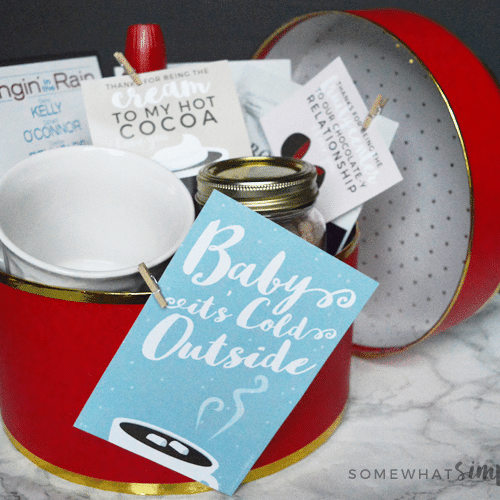 Not only did this seem super time consuming but would it work? 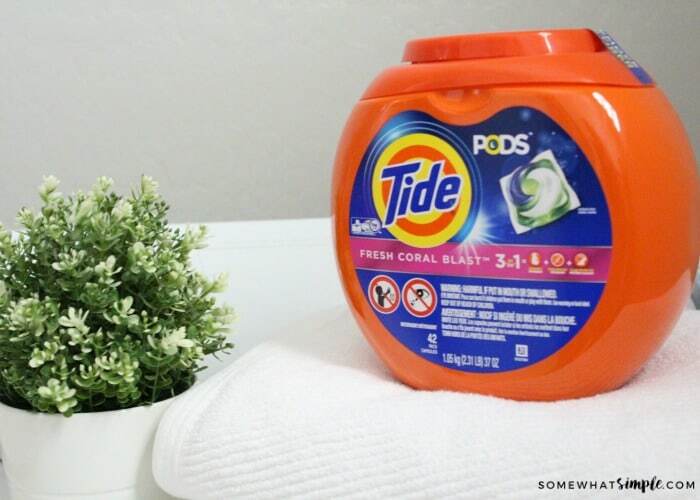 To put these common laundry hacks to the test, I went to the experts – scientists at Tide! They invited me to their headquarters in Cincinnati, Ohio to test common laundry tricks first hand – and I can’t say I was very surprised at the results. I wanted to make sure Tide was testing something that would actually get messy in my household, so before I left, I had a taco night with my family. 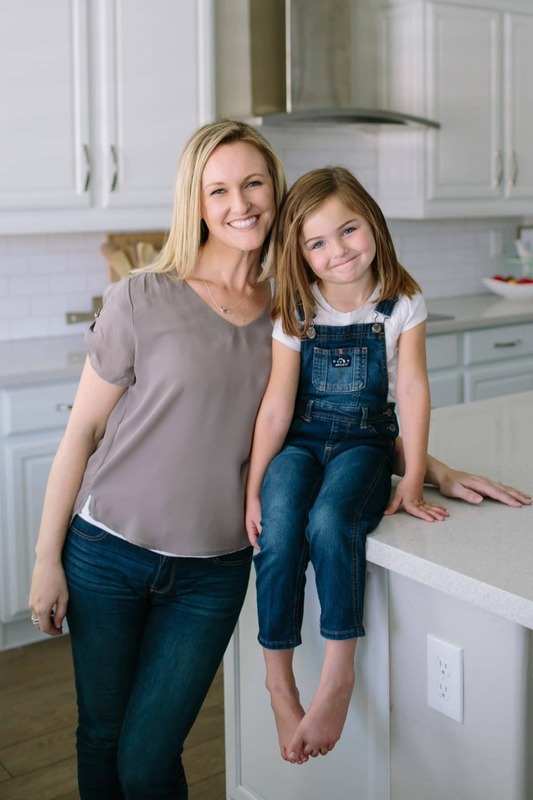 I love spending time in the kitchen with my kids – it is one of my favorite (and messiest) activities. Our aprons got covered in stains and I was really curious if Tide would be able to get them out. I’m here to test some of the common laundry hacks to see how I can combat the never-ending chore that is my laundry pile. 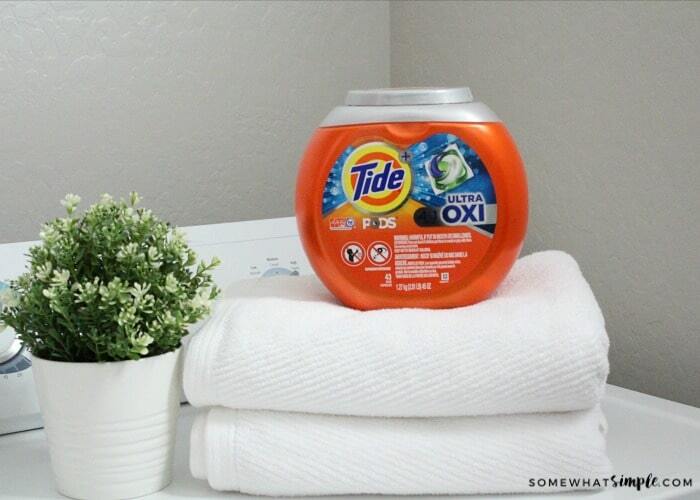 Tide Ultra Oxi is available as a liquid laundry pac (aka POD) and liquid formula. The concept of using lemon juice makes sense. Am I the only one that has tried to use lemon juice to lighten my hair in the summer? The same concept goes for your whites. In theory, lemon juice with bargain detergent should whiten and brighten whites but I learned two things about this laundry hack from the experts at Tide. First, it takes A LOT of lemon juice. Over a cup to be exact, which is the juice from about eight lemons (and lemons aren’t cheap!). Second, not using lemon juice the right way can result in harming clothes. Tide is designed for use on both colors and white clothing, but lemon juice isn’t; in fact, lemon juice has bleaching power and may fade colors if not used correctly. In addition to getting rid of stains Tide’s newest product, Tide Ultra Oxi will keep your whites bright, without all of the unnecessary work for mediocre results. 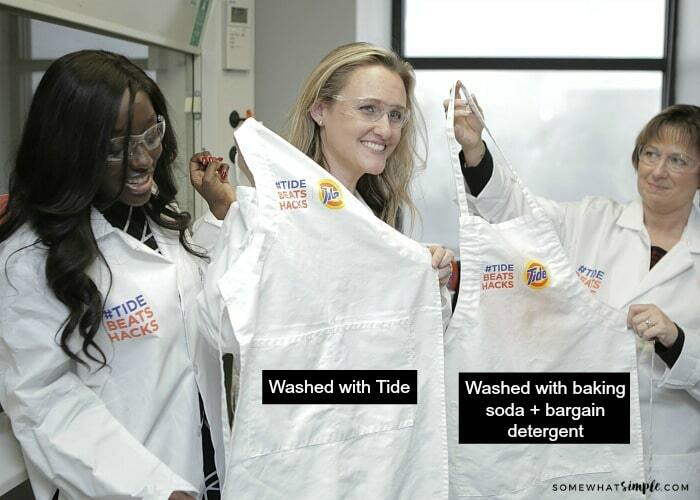 A lot of people swear that baking soda with bargain detergent is the best way to remove a tough stain, so we put it to the test in the Tide Lab. 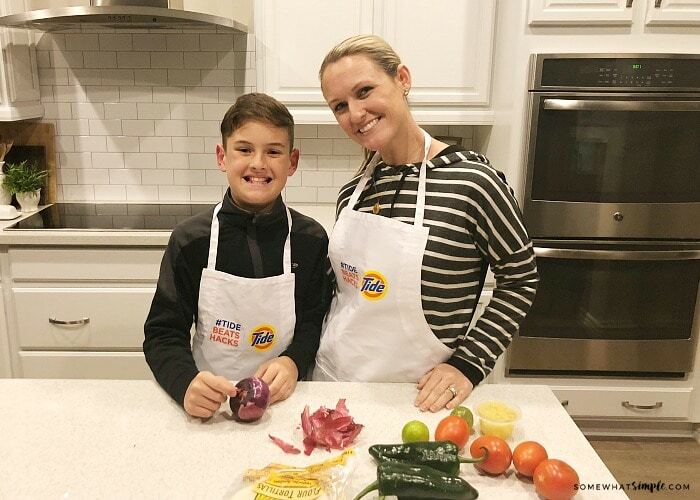 We washed my apron from taco night with a baking soda paste plus bargain detergent and my son’s in Tide Ultra Oxi. Not only did Tide work so much better (check out the photo below), but mixing a baking soda paste took a long time. Between mixing and pre-treating, this hack is clearly not worth it. After the test it was confirmed. Tide’s newest Ultra Oxi formula removes stains better than baking soda and a bargain detergent. I’m officially leaving my baking soda to use just for cooking. 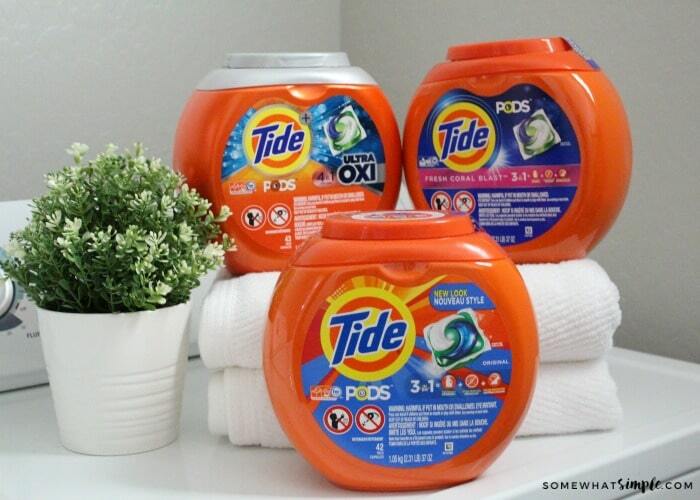 Over the past 70 years, Tide has witnessed a lot of changes in traditional laundry practices. Generations ago, there weren’t high efficiency washers and dryers, nor were there the large-capacity machines that boast minimal water usage. Clothing has changed too, not only in styles but in popular fabrics – there’s SO much less 100% cotton. 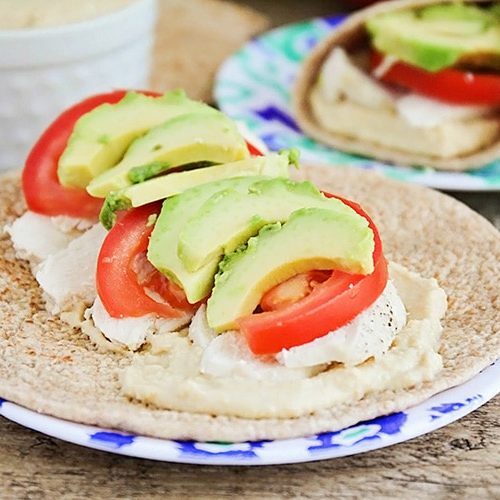 That pair of favorite leggings you live in on Saturdays? Definitely a “synthetic fabric” – aka more likely to attract odors. I’ve read online that running vinegar in the wash cycle helps get rid of those bad smells left behind on clothes. But I learned that vinegar might hurt more than it helps. Since it’s an acid, it can lower the optimal pH of your detergent, making it less effective. Plus who wants their house to smell in vinegar while pre-soaking clothes? Tide also added the new Fresh Coral Blast to its product line, which activates the pleasant scent the more you move! So not only does it get rid of the cause of bad smells, but it helps fight them as they occur. The best times in life are filled with laughs & happiness, and often leave behind a lot of mess. Tide helps minimize your laundry stains and odors quickly and confidently, so you can move on with your life looking great and feeling fantastic! No need to continue to waste your time with inefficient hacks that claim to make bargain detergent work better! Go out and try Tide Ultra Oxi and Fresh Coral Blast and let me know which hack you are officially leaving behind. This is a sponsored post written by me on behalf of Tide. The opinions and text are all mine. I had to use the hairspray trick to get pen out of one of my husband’s work shirts. I was glad it actually worked! My favorite: Prevent damaging other clothes by zipping up items like jeans and sweaters before washing. My hack is to use a used dryer sheet to clean out the dryer lint after a load finishes.